Welcome to the fifth edition of ‘Wrap Around’! Have a question about the greatest game played with a ball? Send it in to MDHandball@hotmail.com, where each month a new question will be addressed by Dr. Zimet and many of our games greatest legends. In the last issue of Wrap Around we explored the depressingly negative trend of sport and physical activity participation. Let’s now turn our attention towards the more optimistic subject of sport development. WHAT is a sport development system (SDS)? A SDS is a clearly articulated, structured, and comprehensive plan with two main goals: increase participation and improve player ability. 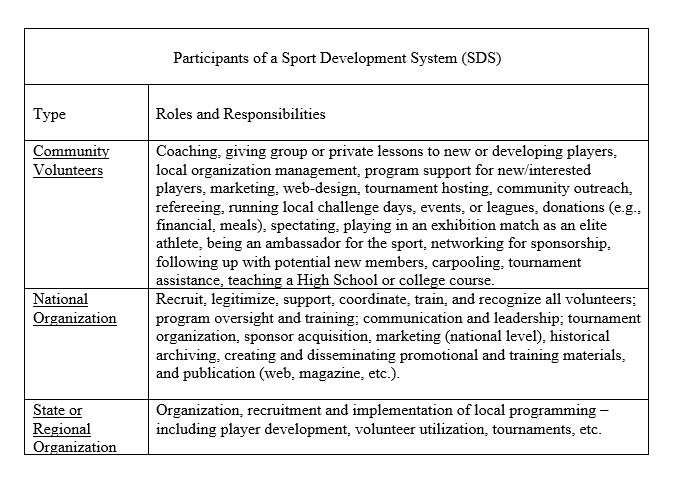 WHO plays a role in the sport development system? 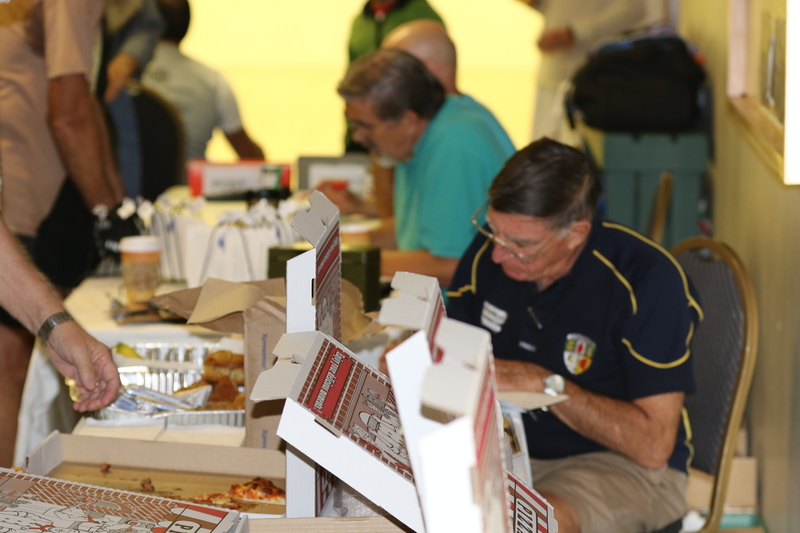 For community based sports like handball, three groups of volunteers play a role: 1) community volunteers; 2) a national organization; and 3) regional/state/community organizations (for a summary of roles and responsibilities, see table). Community Volunteers. Pretty much everything in community sports is accomplished by volunteers, who are typically athletes (or retired athletes) committed to perpetuating a sport they love. These volunteers play varied, comprehensive, and impactful roles in their sport. National organizations. The responsibility of a national organization is largely in the realm of oversight and leadership. As a general rule, it imposes expectations for all volunteer involvement and the training necessary to accomplish its goals. Regional organizations support the mission of the national organization at the community level through implementation of programming via local volunteers. The SDS is much like a living organism, where the national organization is the brain, communicating instructions through the peripheral nervous system (local organizations), which in turn give direction to the body (community volunteers) about how to impact the environment. These systems are highly interdependent, making communication essential. A body without a brain is at best ineffective and at worst dangerous; the mind without a body has practically no ability to impact the environment. In community sports, everyone who is part of the developmental system is a volunteer – including organizational members at all levels. In point of fact, members of the national and state organizations are often the most generous volunteers, taking on necessary but often thankless, time consuming and unpopular jobs. HOW does a SDS work? Sport development is a process where a sport grows its participants via membership evolution. Seasoned/retired athletes convey their love of the game (nurturing) to potential new members (attraction). These new players become committed to the sport (retention) and eventually become long-term participants themselves. 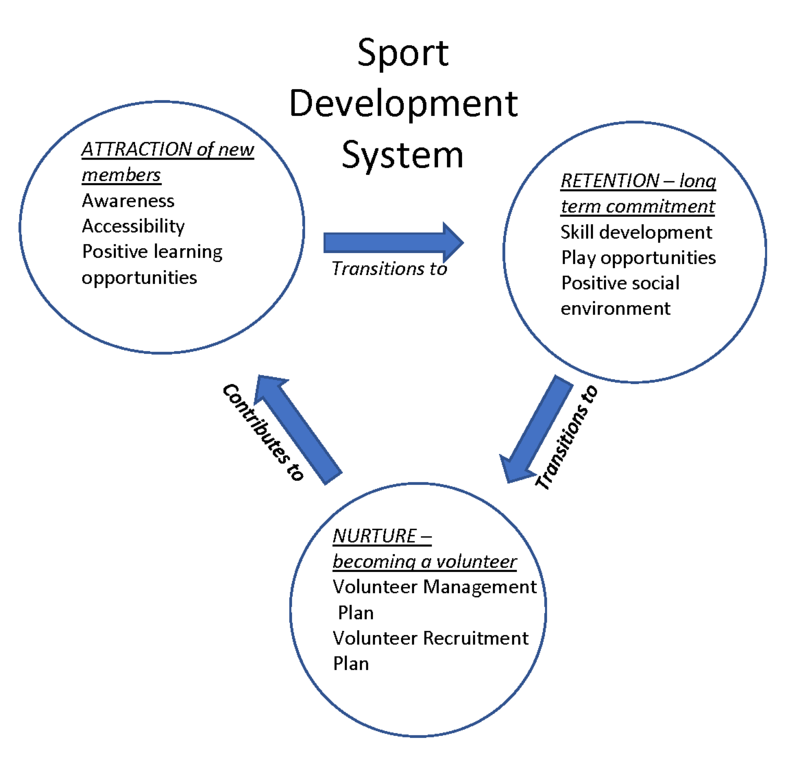 In this way, sport development can be viewed as a life-cycle whereby members evolve through various stages (see Figure). We will review the three-stage SDS model common to community sports; the stages are Attraction; Retention; and Nurturing. Although we will consider each in turn, it is critical to understand that the single greatest challenge is not within the stages themselves, but in the process of transitioning –where an athlete moves from one stage to the next stage. Failure to transition is the largest contributor to drop-out. This point cannot be over-stated, so I’ll repeat it. When an athlete remains stuck in a stage, the sport inevitably fails to flourish. Attraction: Attraction refers to the recruitment process, whereby large numbers of potential members get exposed to the sport and have their first opportunity to play. Best practices in attraction address:1) increasing awareness of the sport; 2) broad and affordable accessibility (i.e., where people play); and 3) creating positive opportunities to learn. Historically, attraction theories were divided into the: 1) top-down model (AKA trickle down); and the 2) bottom-up model (AKA trickle up). A top-down approach theorizes that when the general population gets exposed to elite-level sports, for instance on TV, new members get inspired to participate as well. All marketing in the top-down approach focuses on exposing potential members to elite/professional athletes. In general, this approach has experienced success for sports with a broad and consistent broadcasting market-share. An inherent weakness in the top-down model is its vulnerability to attentional whims and non-applicability for community sports, which lack consistent or broad media exposure. A bottom-up approach exposes new participants through events like youth programming, PE/gym exposure, and local club systems. Both approaches require sufficient infrastructure to support the development process. Since handball lacks strong media presence, creative grassroots market exposure is necessary. Examples include promotions, advertising at handball facilities, competitions, events or open play-days, and PE/Gym or college classes. Regional or national organizations often provide marketing tools, including promotional videos, teaching guides, new-member kits, templates for posters, and web content. Attraction is all about exposing people to a fun, and inviting experience with the sport. One of the most important parts of attracting new athletes is knowing what they want. Research has shown that kids identify two reasons for sport participation: having fun and spending time with friends. With these goals in mind, tennis youth programs began giving questionnaires to kids and parents who attended introductory play-days to find out more about their experience. Here is what they found – “when kids hit more balls more successfully, they had more fun.” These data led to the concept of Sport Modification, or altering a sport specifically for beginners to help them through the initial stages of the learning process. For example, the Australian Hot Shots program uses; a) a softer low-bounce ball, b) shorter handled and lighter tennis racquet, c) a smaller court d) a lowered net, e) creative non-competitive learning games, and e) having a ‘fun with friends’ orientation rather than a ‘play by the rules’ orientation. For more information go to https://hotshots.tennis.com.au/about/. Since the original question asks about recreational participation, my focus will be restricted to the retention of recreational members rather than the development of elite athletes. The distinction is important because different organizational goals necessitate different SDS pathways. When the aspiration of development programs is on finding future professional athletes you often see: 1) minimal opportunities for athletes who fail to rapidly develop; and 2) programs highly oriented on performance outcomes. In contrast, programs aspiring to swell all talent levels emphasize long-term recreational commitment. Hence the emphasis on fun, exercise/health and social opportunities. While both programs include skill development and competition, recreational outcomes are measured through retention rather than elite performer identification and development. Retention is said to occur when an athlete’s participation becomes self-propagating. That is, he or she has taken personal ownership and will independently seek out opportunities to play due to an internalized love of the game. The transition from Attraction to Retention is a period of immense drop-out risk. Solidifying this transition is exclusively the responsibility of community volunteers. You absolutely cannot rely on new members, who are still in the attraction stage, to transition to Retention on their own. o Easy court access and cost-effective equipment. o Leagues where lower-level players are given handicaps (i.e., a C player starts at 11 against an Open player) or are a necessary part of each team (e.g., leagues with a range of talent levels). Nurturing. The core role volunteers play in community-based sport cannot be over-stated. Consider this quote from the president of Australian Football, which parallels similar sentiment from other community sport leaders: “Without the dedication of … volunteers, football clubs as we know them would not exist.” Seventy-three percent of community sport organizations have no paid employees and on average receive only 12% of their funding from governments. Nearly everyone – at all levels – is a volunteer. Research suggests numerous mental health benefits to volunteering 40 to 100 hours per year (i.e., 1 to 2 hours per week). Nurturing, the process of giving back, closes the sport development loop when volunteers support a process that brings in new athletes. Volunteering is a two-way relationship. It is the role of organizations to initiate strategies that organize, support, recruit and train volunteers – locally and nationally. This is accomplished by fostering a sense of community through administrative consideration, leadership opportunities, equity in decision-making, recognition for service, competition and social space. Volunteers are thereby able to make meaningful use of their time and skills, contribute to social and community outcomes, and see their sport flourish. In turn, volunteers need to step forward voluntarily and clarify which interests and talents they are willing to donate. Being effective requires a Volunteer Management Plan, which aims to achieve the two SDS goals mentioned earlier; 1) increasing membership and overall recreational participation; and 2) developing elite level athletes. In studying 35 national sport organizations over a 4-year period, Dr. Sotiriadou found three common roadblocks to the community SDS. First, a lack of linkages among organizations within the sport, which presents as uncooperative or hostile relationships and limited communication or cooperation. Second, the lack of transition between levels of sport development, or athletes failing to move from one stage of the SDS to the next stage. Common examples include a long-term athlete who doesn’t volunteer, and a participant in a youth introductory program who receives no follow-up. Third, the lack of a clear delivery mechanism or structured strategy for recruiting and utilizing sport participants at all levels. Lacking a Volunteer Management Plan is an example of this problem. This results in a chaotic approach to sport development and frequently overburdening a limited number of individuals. Let’s get back to our handball player who was curious about the state of handball outside of his shrinking local club. I would ask him, and everyone else who plays, to consider where he is in the sport development process and how he might be able to contribute. Read the list of possible roles volunteers occupy, and consider, “what can I contribute to the game, no matter how small?” Don’t expect to be asked; take the initiative and contact organizers in your area. If you already occupy an organizational role, particularly at the national or regional level, think about your Volunteer Management Plan. Remember, generals don’t fight on the front lines…they direct the troops. Consider the unique culture of your handball community and try to map the specific pathways handball players take through the sport development cycle. This will give you an idea of where support is needed to help the transition process. On a final note, the information in this issue of Wrap Around comes from research and theory on Sport Development Systems as it pertains to community sports as a whole. While Wrap Around is published by the WPH and USHA, the ideas expressed in this piece are independent of both organizations. It’s an exciting time for handball. We have witnessed a flux of younger athletes (under thirty) at recent events and the attitudes of our sport’s leaders; especially from one-group-to-another has been quite positive and productive; all working on a common goal to grow the game. Our group (WPHLive.TV) has a full-time development director who quarterbacks hundreds of junior and collegiate clinics around America and the globe yearly; Junior WPH, our young-adult namesake, launched a global initiative in 2013 to teach and promote youth handball and all of the benefits that the sport provides. 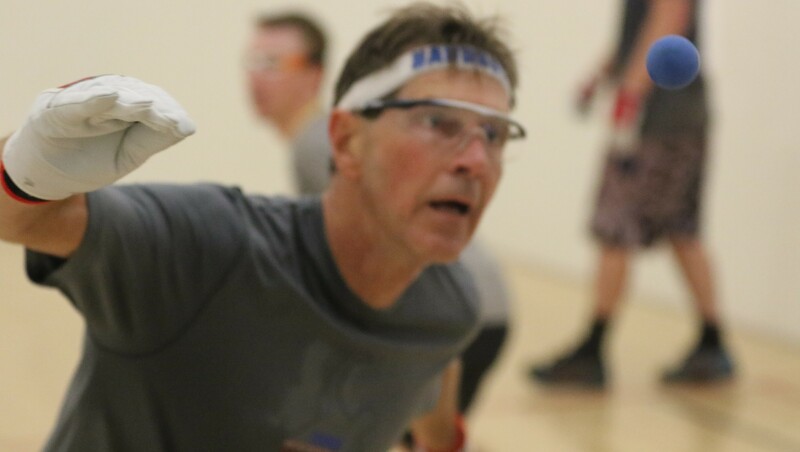 Junior WPH focuses on not just the fundamentals and competition of handball, but also the discipline, leadership, character, and integrity that handball and Junior WPH promotes. 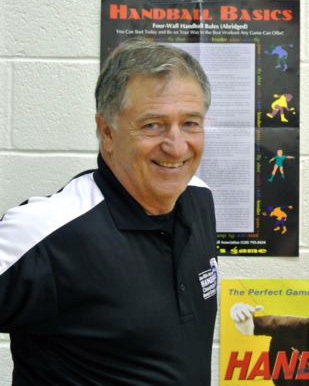 The WPH has certified a number of coaches with the WPH-pinned Coaching Manual and Coaching Certification Process to teach the game in a structured and fun environment. Many of the certified coaches are current pros who are eager to give back to the game and develop the next generation of players. During the professional tour (both indoor and outdoor) our group hosts clinics with young adults at every feasible location. The junior WPH initiatives you just read (above) are also mirrored by the ICHA, GAA, CHA, Fred Lewis Foundation and our sport’s governing body, the United States Handball Association (USHA), in some form or another. Please contact those organization’s leaders for individual commentary. 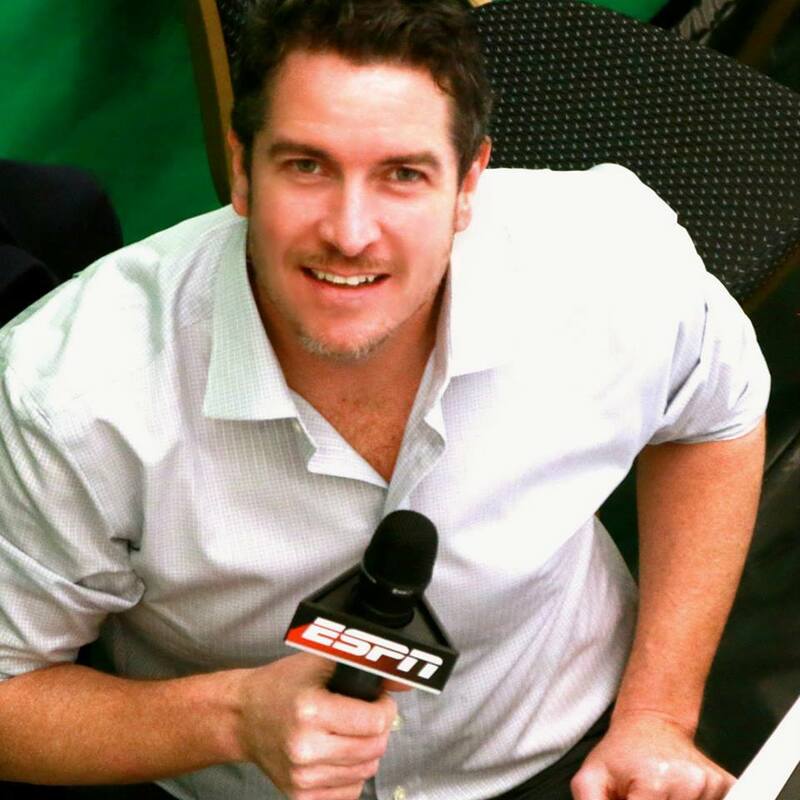 The WPH is especially excited because of a recent contract signing with ESPN that puts 4 wall handball; women and men’s elite; plus outdoors best players (Outdoor World Championships/Las Vegas, NV, Simple Green US Open/Fountain Valley, CA, to name just a few); on the network for up to eight major events in 2016/17. ESPN has reported, as recent as our last indoor tour stop in Minnesota (Nov ’16) that there were 135,000 people who clicked the play button ion the WatchESPN App, associated with ESPN3’s broadcast of the two-day spectacle. With energetic and passionate fans and supporters, such as you, we can hopefully boost those numbers even higher, as we attempt to promote the game on massive levels. The potential reach and ability to promote this game we all love is endless if we all work together. We are very open to your marketing ideas and concepts, so please pass them along. 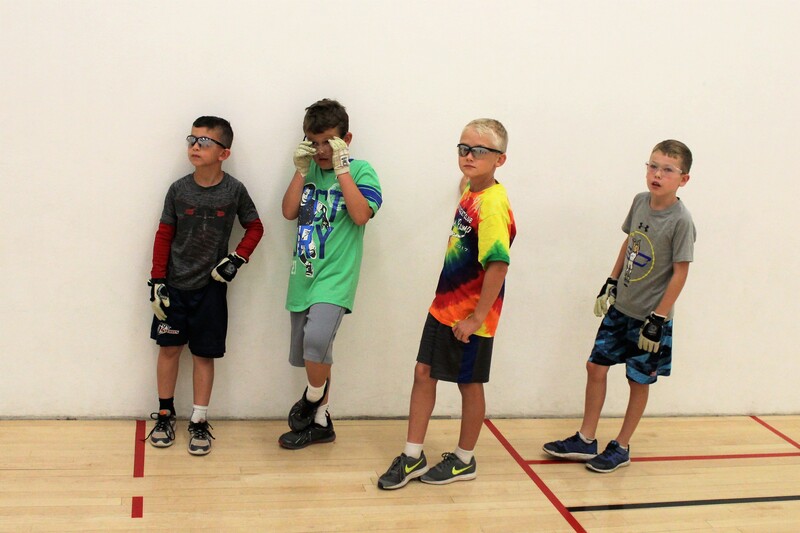 Handball isn’t just four wall indoor play, and our group recognizes that. There are vast assemblages of players, that you may have only read about, that play the outdoor game; be it one wall or three wall; small ball or big ball (wallball). It appears that the outdoor game’s numbers (especially wallball) is trending upwards. Our group, like the ICHA, USHA, et al, before us, focus our attention on all forms of the game and cannot stress just how much we need people like you to help us with our mission. If not us, then the Fred Lewis Foundation, USHA, ICHA, or others in your area (that are making huge impacts), will certainly have open arms to your ideas and gifts. The World Players of Handball is a non-profit charitable foundation (501(c)3) who find it equi-necessary to expand the game and cap-on this growth spurt. Do not think this is a plea for your money. All groups (not just ours) appreciate donations and membership support, but we also ask earnestly for your professional service and time …and support! · Subscribe to the USHA & WPH Email Directory. Both give weekly recaps and updates regarding sport; both promote upcoming events and highlight current affairs and breaking news. · Connect with the Irish Handball Council, GAA-Handball, Canadian Handball Association, Fred Lewis Foundation, Inner-City Handball Association, USHA and WPHLive.TV. Give us more information about the area you play in and we will point you in the right direction, with hopes of matching you up with those close to where you are located. There are many many handball associations that work alongside the WPH and USHA in America that do amazing work to keep this game flowing. 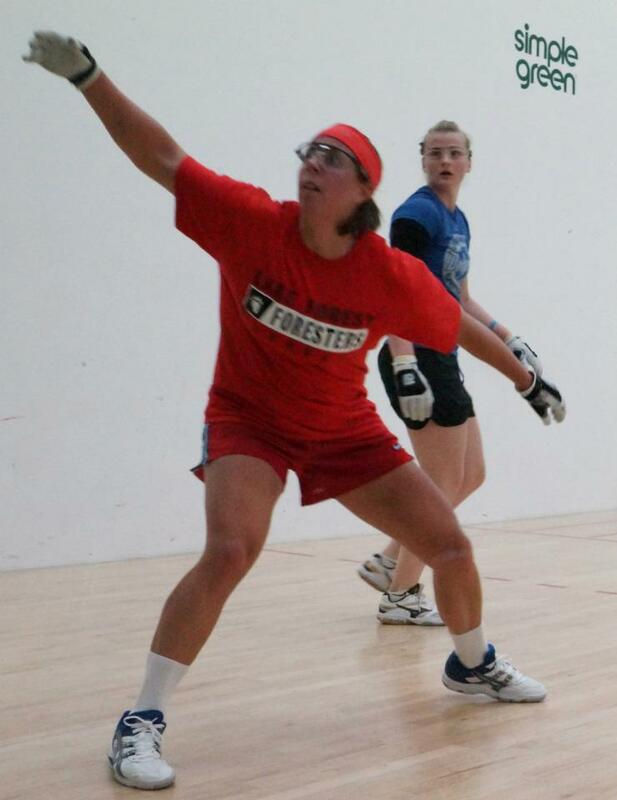 · Become a member of the Governing Body of the Sport, the United States Handball Association. Your membership will bring you many benefits, to include a quarterly magazine centered on handball. Please contact your USHA rep for more specific details, but make sure to put this request at the forefront of your wish-list. · Join the WPH and receive your player’s card. This card will grant you access to all of the handball videos WPHLive.TV has recorded over the past 10 years and all ESPN filmed handball matches. The player’s card will also allow you to watch LIVE handball on many (if not all) smart devices, laptops, computers; PCs & MACs. Your membership brings two instructional videos of David Chapman and all proceeds go toward junior development w/Junior WPH. · Daily to weekly updates regarding handball can be found at www.wphlive.tv. Since Jan 1st of 2016-to-date (December 1st, 2016 as I write this response), the WPH has posted 340 stories to the front page. 2015 had 345 total stories posted for the year. This does not include social media. Our Junior WPH Site is at www.juniorhandball.org and will focus just on junior handball from the WPH perspective. · Weekly and breaking news can also be found on the USHA homepage of www.ushandball.org; please also connect with the USHA on Social media and do not limit yourself to just these two organizations; most if not all, are connecting to handball players all over the globe through mediums like YouTube, Facebook, Twitter, Pinterest, Instagram, Vine, SnapChat, R2sports and more. Your smart device’s app store will have downloads available; mostly free! · R2Sports Web App will connect you with handball tournaments, scores, player profiles and chat room; future events, past results and more. Add them to your weekly mix and you will not be let down. I use it daily as the app sends me notifications of my favorite players right to my smartphone. You can find the App in iTunes and Android’s App stores for FREE! You can also track events on your computer at www.r2sports.com. Search Handball and you are on your way. Keep your head up. 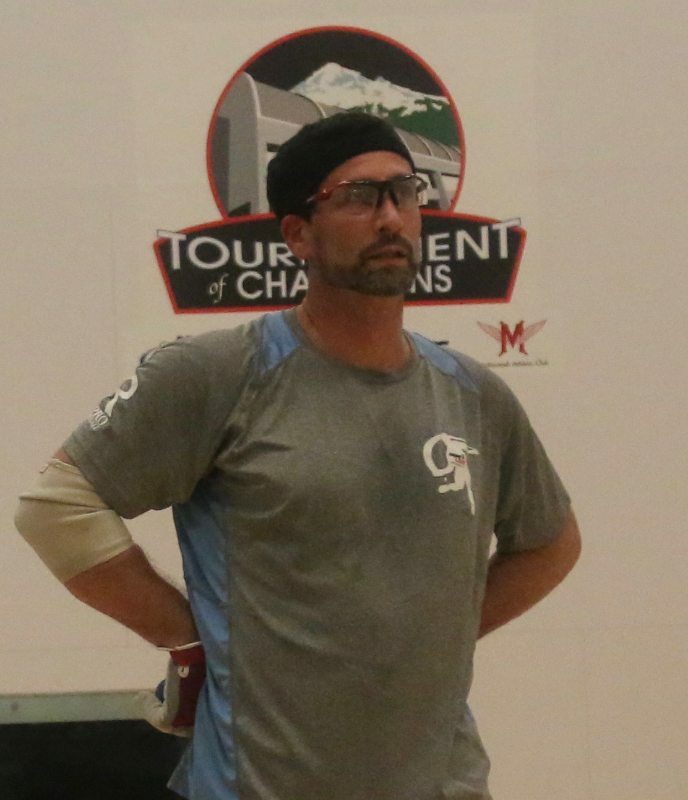 Handball is growing and could be defined as a “shifting” of sorts with older players winding-down their careers; while growth is happening outdoor across the globe and in area hot spots in vast numbers; just as indoor 4 wall is starting to see a big boost in junior and young adult play. Unless recent trends are playing tricks on us, the state of the current four wall game should be constant, moving forward. Many recent local and regional tournaments in the last quarter of the year feature nearly, if not more, than 50% of the participating attendees under the age of 32. Some events had more than 75%! If you have not learned about the growth of the sport in Ireland, England, Italy, Spain and Europe, then please ask about! The 4 wall game in Ireland is thriving, just as their love for the 1 wall outdoor (played inside too) form of the game is skyrocketed. We know you probably have more questions and I know all organization leaders will have some great answers, so please contact us and we will try to point you in the right direction if we cannot find any resolve. Four-wall Handball has grown and shrunk in various locations over the years. There are hotbeds that feed on themselves and there are club/cities like yours where it seems the game is waning. Without getting into all the potential reasons why, or naming the all the places that have grown or waned, there are also other versions of the game that are growing, mostly those played outside. As for the hotbeds for four-wall and what is being done, there is a common denominator: a local person or group supporting the growth. The USHA and its First Ace program have supplied grant funding, equipment, tournament support, etc., to such people and groups. And there are young people playing. Witness our national collegiates with close to 300 players, 100 of which are women. Never would I have imagined those numbers when I was in college. Our goal is to keep these people playing by introducing them to groups such as yours when they graduate and move into your community. We hope you’ll welcome them with open arms. There’s much more being done to grow handball, all handball versions, as you’ll see in our First Ace columns and annual reports. We also welcome new ideas on how to keep courts, fill them and share the joy of the perfect game, which is our mission statement. How did you first come to learn about handball? Who got you involved, what was the introductory process and what was it that led to you getting more and more involved? When I was 13 years old, I would go to the Lattof YMCA to watch my brothers play in Don Quinlan’s class, and after much reluctance I tried it. Lynn Alesi was instrumental in getting me to play, because it was motivating to see another girl playing. I became more and more involved after traveling to tournaments with Don and the other juniors players. It was fun to see my game progress, and to see the same people at different tournaments. By the time I was a senior in high school, I was hooked. Going to Lake Forest College and being coached by Coach Dau was life-changing, and helped me play at another level. I hope to play handball as long as I am physically able to. I first came to learn handball through my father and older brother back in the mid 70’s. They went to play as something to do for a “father son” bonding at the local YMCA. In a short time, I started to tag along with my Dad and met my brother there as well. They had their set games and I was there to play basketball, racquetball or just to watch. After awhile my brother would spend time with me teaching the perfect game and the “hop” I eventually became know for. My first recollection of becoming aware of handball was when I was probably in the fifth or sixth grade. I was a member of the Oak Park, Illinois Y, at the time, and took swimming lessons, played billiards and pool and watched the Saturday movies with the other kids. While in the old building I stumbled upon the two four wall handball courts. My impression was that it was a game for adults and kids weren’t allowed on the courts. The players were very old (30+) and they were able to buy their own gloves and ball. Kids my age were not welcome on the courts. My first introduction to the game came in gym class in 1953 at Fenwick High School. Many of the priests had played a form of 3 wall handball at the nearby seminary. Also the football and basketball coaches, who were our PE instructors, had learned and used handball for training and conditioning purposes. So, it was natural to introduce the students to the game of handball on a makeshift 3 wall court in the corner of the basketball court during gym class. Because I was on the tennis team in high school and my first year and one half at the University of Notre Dame, I didn’t find time to play handball. However, when I decided that there was little chance of me being an important part of the tennis team, I looked for another form of competition in 1957. There were a number of undersized courts (18 x 36 foot) at the Rockne Memorial athletic facility and usually there were many students looking for a game. It seemed like a natural transition from tennis for me. As my play improved I discovered the best players on campus played at the 2 – 22 x 44 foot courts at the old field house which was built in the 1870’s. After graduation in 1960, I returned to Oak Park and began playing on the 20 x 40 foot courts at the new Y. Although I won a Class C Singles tournament, I didn’t start playing and winning City, State and Regional Tournaments until moving to Columbus, Ohio in 1966. Columbus friends, Bob Whitman got me involved in one wall handball and Tom Bogen in 3 wall. Prior to 1973 we put on outdoor summer handball tournaments in Columbus, while Vern Roberts Sr. and a couple of Cleveland players put on outdoor tournaments in Cincinnati and the Cleveland area, respectively. Players from all over the state of Ohio and Western Pennsylvania attended these tournaments. While in Columbus I first became involved with the local handball committee and a life time member of the USHA. The major accomplishment of the Columbus Handball Committee was getting 6 3 wall handball courts built with the support of Councilman and avid handball player, Don Woodland, and holding the USHA National 3 Wall Championships for the first time in 1973. 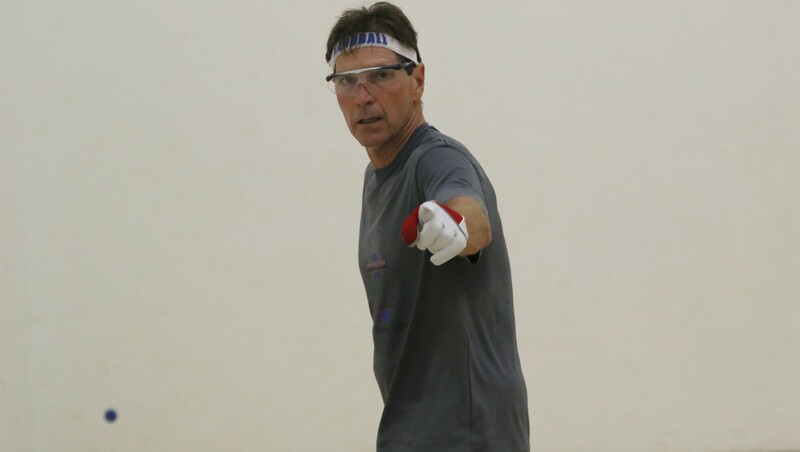 It wasn’t until I moved to Dallas, TX in 1973 that I won my first USHA National Masters doubles titles in 3 wall (2001) and 4 wall (2003) both with Ed Grossenbacher and one wall (2005) with Mike Ferber. The first USHA National Masters singles titles were 3 wall (2005), 1 wall (2006) and 4 wall (2014). Since moving to Dallas, with the encouragement of Tom Easterling, Beth Rowley, Alvis Grant, Vern Roberts Jr. and others, I have become a member of the Dallas Handball Committee , a member and Treasurer of the Board the USHA for 9 years, Southwest Regional Commissioner of the USHA, member of the USHA Hall of Fame Selection Committee and past Vice president and current Secretary/Treasurer of the World Handball Council. I continue to put on annual 3 wall tournaments at my court in the Dallas suburb of Parker. As my game has developed and the number and scope of the tournaments played in broadened, I have met many handball people who were more involved in the promotion of the sport. These people, by their enthusiasm and example, encouraged me to become more involved in handball. With the increased involvement in the promotion and development of the sport, my wife and I have met many wonderful people worldwide and have established many lasting friendships in the USA and abroad which would never have happened, if it weren’t for handball. I remember walking as a child on the boardwalk of Coney Island heading to the rides of Astroland Park when I first saw the handball courts. The courts were filled with people and I saw the players hitting a rubber ball against a wall. There were crowds of people watching the games and little did I know then how much I’d later appreciate doing that very same thing. It wasn’t until I was about 14 years old that I really started to play a lot of handball and the main reason was because of the girls at the courts. I played a lot of baseball and basketball but I noticed that more girls hung around the handball courts and that eventually drew me over to the courts. I’ve always been competitive and once I became the best player at my home park at Grady H.S. 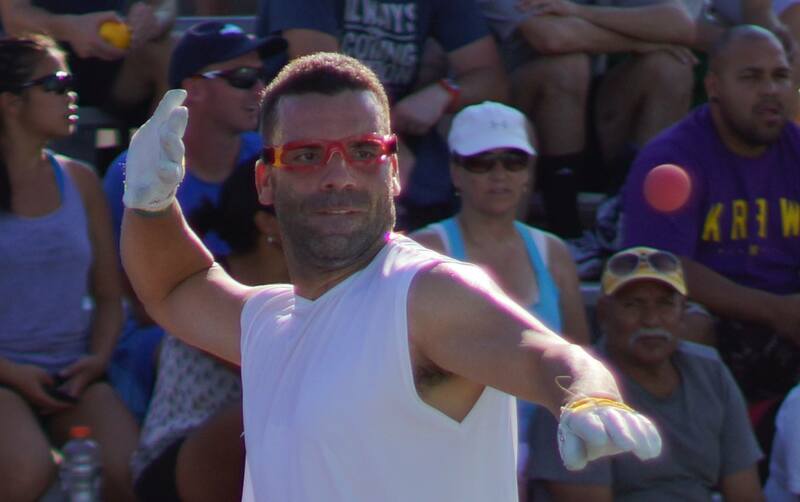 I ventured to the courts at Coney Island and saw a new level of play. I saw the players, the crowds, the action and I was hooked. I watched the players playing with so much passion that you couldn’t help but to watch. It seemed like everyone was playing for something. Some played for pride, others played for money. Whatever motivated them made it an all out war! It was all the same. Kill or be killed. A truly primal scene that drew people in from all walks of life. I could see why people called it the Mecca of 1wall handball. You had former, current and future champions roaming all over the place and each of them offered a different type of challenge or lesson to dish out. I was fortunate enough to live near by in Brighton Beach so I could walk, jog or run to the courts whenever I wanted. There were so many players who played a part in my handball upbringing but from Coney Island I’d have to say that Ruby Obert and Albert Apuzzi really influenced me a lot. Ruby showed me how to work on the fundamentals and Albert brought me to the indoors courts where the strongest players played during the winter season. I played on the B court at first and over time I got into the stronger games. But you had to be invited into the stronger games. I had a strong arm and I hit the ball with a lot of spin so I had something to offer for practice against the better players pretty much right away. It felt like in no time I was in the mix against guys like Al Torres, Joe Durso, Albert Apuzzi, Paul Lonergan and a bunch of other top players. Through Albert I eventually met Eddie Maisonet and then partner Paul Williams who was the ICHA president. Albert and Paul played an intricate part in my competing in tournaments. They showed me what organized handball looked like and I loved it. Both of them were strong role models on how a man should conduct themselves both on and off the court, with class and dignity. True gentlemen of the sport who were also fiercely competitive on the court. They showed me the proper way to handle the tournament scene, it’s players and referees in a manner that was both professional and assertive. Albert and his wife Dori Ten would give me a lift whenever possible to tournaments all over the city. Paul ran a bunch of those events and I’d see how many people were involved in making it happen. It was a great experience for me. I became a member of the USHA and ICHA and over time I started to travel with the ICHA’s travel team. The ICHA helped me travel all over the world to play the game I loved. It’s truly been a blessing for me. It gave me priceless memories and joined me with so many great people from all versions of handball. I still enjoy connecting with people across the globe that I met at various events from years ago. I no longer live in the area of Coney Island but I still try to make my way there to play and interact with the players there. They’re like family to me. Benji Bretner was also a constant at the courts and he definitely showed me through example how important it was to keep the ball in play above all else. He was as steady as they come and because of that he had a very high winning percentage. He also new his limits and rarely got himself in a game that he didn’t feel would be worth the gamble. We played singles once and with Benji there was always a bet. I barely won the game and he didn’t run it back telling me that I was too strong for him. He surely could’ve beaten me at that time. Beating him was not an easy task for just anybody. I was coming up and wanted to play him again because I was gaining from the experience from him. However, for Benji getting the win wasn’t worth the time or effort it would’ve taken to do it. So we left it at that and went on to play each other countless times in various doubles games. We also played together combining my risk taking style and his steady percentage handball to make an excellent combination. He’d get on base and I’d swing for the fences. Even today Benji is still very well maintained and holding it down at the Coney Island courts. I still enjoy getting into games with Benji and showing some of the young bucks how it’s done. Passing on our experience on to the next generation of players is key in continuing this great tradition of quality handball. The courts are rich with history and continue to breed future champions like the twins Melanie and Jessenia Garate. Helping the younger players helps keep me invested in the game and it’s future. I was one of the lucky ones in that my dad was a very good player and he spent a lot of time with his kids. That’s why six of his eight kids play(ed). More so, I went to tournaments, saw very good handball and could visualize what the game was supposed to look like before I started playing regularly. Thanks to my dad, I was enjoying the mentoring of adults, traveling to tournaments and a member of the handball fraternity by my teen years. When I did start playing, the camaraderie and support kept me coming back and a little success sure helped boost my ego. Most of the people I looked up to were handball players, even though handball may not have been the reason – of just part of the reason for my admiration. And that is still the same today! Dr. Dan Zimet is a Psychologist and Certified Sports Consultant. Dr. Zimet has been working as a Psychologist for more than 15 years in private practice, specializing in young adult and adolescent issues, marital counseling and sport psychology.